I just rediscovered this video: the former dean of the Harvard Extension School, Dean Michael Shinagel, addressing the 481 graduating ALM, ALB, and certificate recipients in 2008. He talks about everything from his work in progress (The Gates Unbarred), the profiles of the graduating students, and other topics. There are many statistics and anecdotes that HES alums and current students may find interesting. Enjoy! So you’re thinking about attending the Harvard Extension School, or you want to know more about the degree programs. A common question that prospective candidates have is whether students are taught by real Harvard faculty. Others are interested in whether Harvard Extension faculty are tenured professors at the University. The short answer: It depends on the concentration and the classes being taken. Looking at the Harvard Extension Faculty Directory, the first page of results contains numerous associate and assistant professors, lecturers, and preceptors from FAS, the Harvard Medical School, the Harvard School of Public Health, Widener Library, and other units. The page also lists faculty from other area universities (Boston College, Suffolk, Northeastern, UMass, etc). There are many non-academic-affiliated instructors, too, who teach in the Extension School’s professional programs. Generally speaking, the liberal arts and science classes are more likely to have Harvard faculty, including tenured professors. The Extension School has a “Harvard Instructor” requirement for the liberal arts masters degrees, requiring 7 out of 9 courses to be “a faculty member with a teaching appointment” at Harvard. However, the school bends the rules for Summer School classes. All Harvard Summer School instructors are regarded as Harvard Instructors, even if they don’t have a teaching appointment. That’s not just for Extension School students taking Summer School classes; the rules are bent for Harvard College students attending the same classes — most on-campus Summer School coursework counts for credit for attending Harvard College students, with some conditions. Online classes offered by the Summer School cannot be taken for credit by Harvard College students, though. The 3 or 4 courses I took during the summer generally had non-Harvard instructors, but counted toward the Harvard Instructor requirement based on the Summer School exception described above. The Northwestern and Western Michigan lecturers had received AB/JD and PhD degrees from Harvard and had visiting scholar affiliations at Harvard, while the late Professor Thomas H. O’Connor of Boston College was considered the leading scholar in his field. For other liberal arts concentrations, it’s possible to choose classes so most or even all instructors are tenured Harvard faculty or tenure-track professors. I know students who have done this, or even applied for (and received) Special Student status to take GSAS/College classes taught by Harvard faculty. … The professional degree programs have failed to fit the model established by the Extension School to offer a Harvard academic experience led by Harvard faculty members to students. 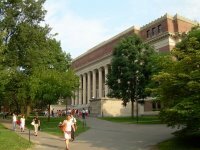 It further sets a precedent for launching new professional degree programs that have no connection to the University’s existing areas of study, and opens the door to criticism that Harvard Extension School degrees aren’t “real” degrees because they no longer represent study under Harvard’s top-notch faculty. I advise students considering these programs to make every effort to take actual classes with real Harvard faculty. For some fields, it’s impossible because there are no Harvard instructors available or willing to teach in these areas. But for others, there may be course offerings from time to time. In summary: If you are looking for a real Harvard experience, take as many classes on campus with real Harvard instructors as you can. I received an email from a prospective student asking about the Harvard Extension School’s ALM in Management program. He wanted me to compare the ALM in Management vs. a full-time MBA. In my reply, I noted that I have never taken any ALM in Management classes. My ALM concentration was history. But I have followed the Management program since it was introduced and have a full-time MBA under my belt, and feel qualified to make some comparisons. There is no cohort experience, vital for building a network that can serve you long after after the program concludes. Even though many of the classes are similar to those you would find in a business school, the ALM in Management degree is technically not an MBA. It’s a liberal arts degree in management (!). This fact may cause skepticism among some potential employers. Most instructors are not Harvard faculty, and there is no affiliation with the world-famous Harvard Business School. While online classes are a lot of work for students, they are not a substitute for in-person learning experiences. Extension School students have complained about some of the deficiencies in the past. Recruiters either don’t know about the ALM program, or don’t regard it as a good program because it’s part-time, mostly online, etc. Note that some recruiters view any part-time business degree with skepticism. Among recruiters, the reputation of the school has been damaged by HES graduates who have omitted their Extension School background on their resumes. In some cases graduates have innocently followed the Harvard Extension School resume guidelines, but in many cases there have been deliberate attempts to portray themselves as graduates with a Harvard MBA or Harvard College degree. In other words, it’s a mistake to assume the ALMM is like a Harvard MBA lite. That said, I think there is real value in some of the on-campus classes that expose students to important business concepts. There are takeaways that can be brought back to the workplace, or help students shift their careers in a new direction. For students who cannot enroll in a full-time MBA program, ALM in Management classes are an attractive alternative. Harvard Business School has a full-time MBA program. (See note at the bottom of this post regarding 2014 change in official guidelines) If you are a graduate of the Harvard Extension School, how should you list this accomplishment on your résumé, or on LinkedIn? That’s easy. You type “Harvard Extension School” in the place where the university name is supposed to go. For the degree name, write out “Bachelor of Liberal Arts” or “Master of Liberal Arts”, or type the official designation, ALB or ALM. Then add “Museum Studies”, “History”, “Biology”, “Information Technology”, “Management”, or other concentration in the place where the field of study is listed. Simple, right? It clearly identifies the school you attended, the degree you received, and your area of concentration. I have a master’s degree from Harvard obtained through the HES. My diploma says Harvard University (in latin no less). I have had headhunters and recruiters question me on it and state that it was misleading for me to list Harvard University as my school. My diploma says Harvard University, my classes were all taken on campus at Harvard (before online classes were popular), so many had to be taught by Harvard professors and not instructors, I completed all the degree requirements. I don’t see anything misleading and I don’t know how else to list it on my resume. The headhunters are right. It is misleading. Every student and alumnus at Harvard identifies with the school he or she is affiliated with. And, like it or not, “Harvard University” is synonymous with “Harvard College” in the eyes of the public, and many people in the corporate world. At the graduate level, “Harvard University” is associated with the Graduate School of Arts & Sciences programs that lead to MAs and PhDs. The Extension School is very, very different than the College or the advanced programs in GSAS. As for the comment that she doesn’t know how to list the name of her school on her resume, why not list “Harvard Extension School”? This question gets to the heart of the identity issue. Some graduates don’t want to admit they attended the Harvard Extension School, because of the stigma associated with the part-time program. Other Extension School graduates deliberately take advantage of the “Harvard University” label to mislead people into thinking they attended the highly selective College or GSAS programs. Indeed, every few years in The Crimson there are reports of Extension School students (matriculated or not) insinuated or outright claiming to be College students to other people at Harvard. It happens all the time. No one at the Harvard Extension School majors in “Extension Studies”, so why do we have to state this on our résumés? The only reason I can think of is to compensate for the misleading use of “Harvard University”. But if you are clearly stating the name of the school (e.g., Harvard Extension School) instead of “Harvard University” there is no need to add this inaccurate qualifier to the name of the degree. Of the Extension School graduates who do state “Harvard University” on their resumes and LinkedIn profiles, most leave out the required “In Extension Studies” label that the Extension School demands. Their argument: “Harvard Extension School is one of the 13 degree-granting schools, therefore I have the right to use ‘Harvard University’.” It’s a convenient excuse that lets them sidestep the stigma and questions from colleagues and recruiters. The comment above as well as many of the responses to this blog post reflect this attitude. Why this exception? My guess is the Harvard Business School got tired of fakers running around suggesting that they had completed the MBA program …. or the Extension School wanted to avoid friction with the B-School. I never followed those guidelines, either. I felt “Harvard University, Master of Liberal Arts, Concentration In History” was misleading and not representative of the degree that I earned through the Extension School. I have always used “Harvard Extension School” on my LinkedIn profile and paper versions of my resume, and clearly state this fact on this blog and elsewhere. Be proud of your school. As anyone who has completed the ALB or ALM programs know, it requires years of dedicated study and some extremely challenging academic requirements, from the Harvard Extension School admissions requirements to the ALM graduate thesis. People who take online classes have it even harder, as there are no nearby students to turn to for support and it’s often impossible to ask questions during class or interact with faculty. The Extension School’s official guidelines obfuscate the degree and serve no one except for those graduates who want to claim “Harvard” on their resumes while avoiding the actual name of the school (no longer true since the Extension School updated its guidelines to allow “Harvard University Extension School” while dropping “in Extension Studies”). If you insist on using “Harvard University” on your resume while knowing that most people reading it will assume it refers to Harvard College or GSAS, you’re either fooling yourself or are deliberately misleading people. When people find out, it not only makes you look bad, it reflects badly on all of us. Be clear about where you attended school at Harvard, and be clear about what you studied. People expect it, and it’s the right thing to do. Bachelor [or Master] of Liberal Arts, Harvard University Extension School. Include concentration or field of study, minor, and degree honors when applicable. Clearly the school wants alumni to include “Extension” somewhere in the listing. What is a MOOC? And why does it matter? For people who follow online education, it’s easy to forget that MOOCs — basically prerecorded video lectures and online components such as discussion boards, surveys, and course materials intended for audiences of thousands of students — are a relatively new phenomenon. Soon, however, they will become mainstream, as more young people are exposed to MOOC coursework and colleges succumb to pressure to reduce costs related to faculty and physical classrooms. Will a MOOC instructor answer my emails, take a phone call, or meet with me in person? Will a MOOC instructor help me network with potential employers and internship sponsors? Will a MOOC instructor be my mentor and help me navigate an increasingly difficult job market? Will a MOOC instructor connect me to other like-minded students and professors? Will a MOOC instructor act as an advisor for any interest groups or clubs at my school? Will a MOOC instructor know who I am? What do students think about online education? The [Harvard Extension School] doesn’t offer an internet degree yet, to Kendra Kratkiewicz’s regret. This semester, she’s forced to make the long drive from Billerica to Cambridge as she toils toward her master’s degree. Nothing would please her more than a chance to complete her Harvard education without having to show up at Harvard. In the rush to celebrate the convenience of sitting in front of a computer at home, Harvard Extension School and some of its students forgot how important face-to-face interaction is. Shaquille O’Neal received his doctoral degree in education last week. It wasn’t an honorary award — he earned it from Barry University, a private Catholic institution in Florida. It’s an admirable achievement that required lots of hard work, both on campus and off — he took many courses through distance education, but also had presentations and other activities on campus, as in the photo provided by Barry (the other person in the photo is David M. Kopp, Chair of the Organizational Learning and Leadership and Human Resource Development Programs). But I noticed an interesting thread in the Gawker story about Shaq’s graduation. The entertainer and former basketball star received a master’s degree from the University of Phoenix prior to getting his doctorate from Barry. The Gawker story only mentioned Shaquille O’Neal’s UoP degree in passing, but it brought out a lot of spirited comments, many of them highly critical of University of Phoenix degrees. Does “a Master’s degree from University of Phoenix” even mean anything? Lots of companies (and government agencies) pay for their employees to return to school for MBAs and such, and a substantial number of those people end up at UoP. It’s one of the top destinations because a lot of the time the employee just needs those extra letters behind his/her name, and the curriculum isn’t really that different from any other program. You know what, if I ran a business I would take a UofP MBA over a BC/Columbia MBA every day of the week. Usually the people taking online classes are doing so because they are already out in the workforce, not everyone had daddy paying their tuition. 2. Not sophisticated enough to realize that UoP is among the most expensive choices and has among the worst reputations. This is not the sort of person I am interested in hiring for anything other than low-level grunt work. These comments are cruel and unfair to students who put in a lot of work to earn their degrees. However, they do reflect real problems with UoP standards (which are affected by its for-profit mission) and perception in the marketplace. I wrote about this issue six years ago on another blog, and the post attracted more than 100 comments from UoP supporters and critics. My publishing company counts newer for-profit schools as well as nonprofit educational institutions among its customers, with our LinkedIn book being one of the top sellers for students from both types of schools. It really shouldn’t come as a surprise. Regardless of which school they attend, many grad studentswant to improve their career opportunities. It’s not just about getting a bigger paycheck, but also being able to network with other professionals and finding new job opportunities via LinkedIn’s huge jobs database. The presidents of MIT and Harvard had a major announcement this morning regarding EdX, a non-profit venture to make certain Harvard and MIT courses freely available to anyone with an Internet connection. Unlike MIT’s decades-old OpenCourseWare initiative, which basically involved posting course curricula and problem sets online along with a few videos, edX goes much further. MITx and soon HarvardX has more video, structure, community, and even testing mechanisms to students can track their progress. EdX will be an independent umbrella organization to help run the two programs and share certain resources. EdX is not really news for MIT. MITx was announced late last year, and made a huge impact. Hundreds of thousands of students have signed up to take MIT’s science and engineering classes. MIT even announced that people completing a set of courses would receive some sort of non-degree certification. MITx (and Khan Academy) made a lot of universities wake up to the possibilities of supplemental learning for society at large. Harvard was apparently starting to feel left behind; a source told the Boston Globe that Harvard felt “we didn’t want to look like we were playing catch-up.” Indeed, while MITx is already operational and serving its mission, HarvardX won’t offer any classes until later this year. In addition, I noticed something peculiar about the HarvardX side of the venture. Harvard has been running Internet-based distance education continually since the 1990s through the Harvard Extension School. The announcement said that EdX would be separate from this and other existing distance education offerings through the Harvard Business School and Harvard Medical School. In the press conference, Harvard’s provost briefly mentioned the expertise that the Extension School had developed, but it looks like there is no connection between HarvardX and the Havard Extension School. Indeed, I am wondering if the free Harvard offerings from edX will compete with the Extension School’s own desire to get paying students to “sample” Harvard courses online. If casual students see that they can sample Harvard courses for free via edX, why should they pay thousands of dollars to take an Extension School class online? The Extension School can say that they offer credit for online courses. But to casual students paying $2000 or more for educational credit that will probably never be used, this doesn’t seem like a good value considering Harvard-branded knowledge can be obtained elsewhere for free. I just posted a comment on a Chronicle of Education column by Kevin Carey about an online education experiment at Stanford. The Stanford experiment, involving an AI class taught by computer scientist Sebastian Thrun, was an incredible success — more than 100,000 people took it. It’s also proof of the effectiveness of online education to spread knowledge to people who otherwise wouldn’t be able to attend the class in person. I’ve been a big fan of Khan Academy for years, and fully support what MIT is doing with MITx. They couldn’t raise their hands or participate in any spontaneous exchange of ideas with the instructor and each other. They couldn’t approach the professor after class at the podium to ask follow-up questions. They were watching the lecture on a small video screen. The in-class students were getting a full-resolution, high fidelity experience. Did they have advantages over the in-class students? Certainly — being able to rewind the video or study from their comfort of your home is incredibly liberating. And many of those students were certainly more dedicated than the in-class students who fell asleep. But the claim that the online experience is “exactly” the same is false. The idea that it’s “better” is also debatable, although that depends a lot on the values individuals assign to face-to-face educational interaction, convenience, and other factors. What do you think? Is the Stanford experiment a harbinger of things to come, or is it a bunch of unwarranted hype for online education? [University of Maryland] University College has more than 100 worldwide locations, but online education is at the center of its operation. It claims to be the largest public university in the United States, with more than 90,000 students, many of them part time. Among them are students who work full-time jobs and have little emotional connection to the university, much less to its leadership. Studying for an exam in the library at UMUC’s academic center in Largo on Tuesday, Ejike Michael looked perplexed when asked by a reporter what he made of Ms. Aldridge’s unexplained absence. Mr. Michael has spent a year at the college taking classes toward a master’s degree in information assurance, but he sheepishly conceded he had never even heard of Ms. Aldridge. “I don’t care. I don’t know. You come here and do what you do,” said Mr. Michael, hunched over a giant tome, Network Security: The Complete Reference. Mr. Michael says he is fascinated with his classes, which are offered at odd hours that cater to working adults like him. UMUC, while state-run, shares some features of the flexible, online-heavy, and career-focused for-profit institutions that play such a prominent role in delivering education to adults. But some of the same qualities that help the institution compete in the adult market may also help explain the almost total silence surrounding Ms. Aldridge. University College employs a largely adjunct faculty. Of nearly 2,000 instructors, 88 percent are part time, according to the Maryland Higher Education Commission. Multiyear contracts, which a handful of nonprofit colleges offer in lieu of tenure, are rarely offered at the university. The faculty faulted the Aldridge administration for alleged cuts that struck them as unfair, such as cancelling math, language and writing labs, requiring students in science labs to pay for “a nonexistent laboratory kit,” declining to pay instructors to teach tutorial labs, and refusing to compensate faculty for travel expenses and even for the cost of white-board markers. “The administration is continually offloading institutional expenses onto faculty and students alike,” one respondent wrote. The administration unilaterally reduced online classes to eight weeks, shorter than the average college semester, and did so “without discussion with the faculty,” Whealy wrote. Aldridge “consistently and strenuously opposed” attempts by Asia instructors to form a faculty governance group, an indication, in their minds, that she was reluctant to involve faculty in decision-making. Welcome to the 21st century college.